NOTE: Anthropologie is offering 20% off your purchase this weekend! Post coming a little later today. Don’t you love outfits that are easy to throw on and do your thing? This look is ideal for weekends or days off from work for me; I can tie the jacket round my waist if it gets hot or roll the cuffs down to full length if I feel a chill. I love outfits that make me feel good wearing them and this one is the kind where friends say “Cute!! !” upon arrival. I’m especially celebrating the Chloe purse, which I found for a complete steal. It is sold out, but I found a very similar bag — here too — (for much less than even my steal) that has the same look and feel. 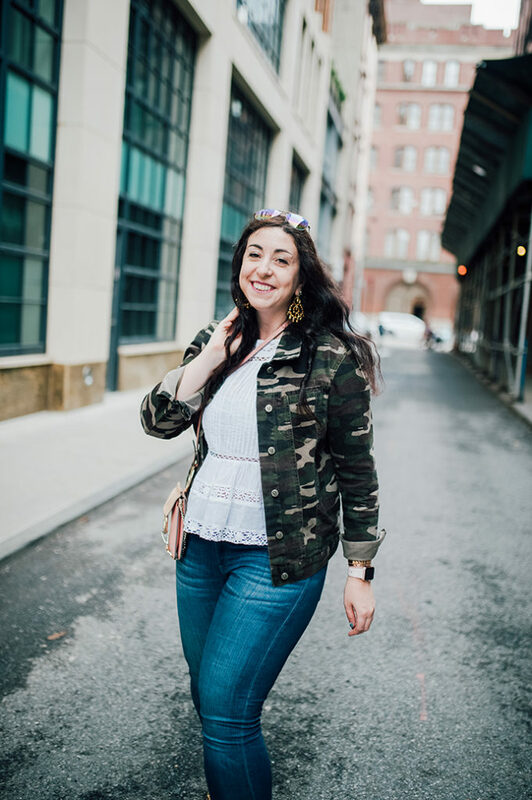 Earlier this week I shared my process for creating Spring layered outfits and this jacket was included. It has an oversized fit and runs large on top of that (I sized down to a small) which is what I think is leading to all the negative reviews on Anthro’s site. For me, this jacket is one of the better fits I’ve had a denim jacket, which I never expect to be body-skimming. This one is a great length on my 5’8″ frame and has a good cut across the shoulders, back and down the sleeves. They are ideal for cuffing! 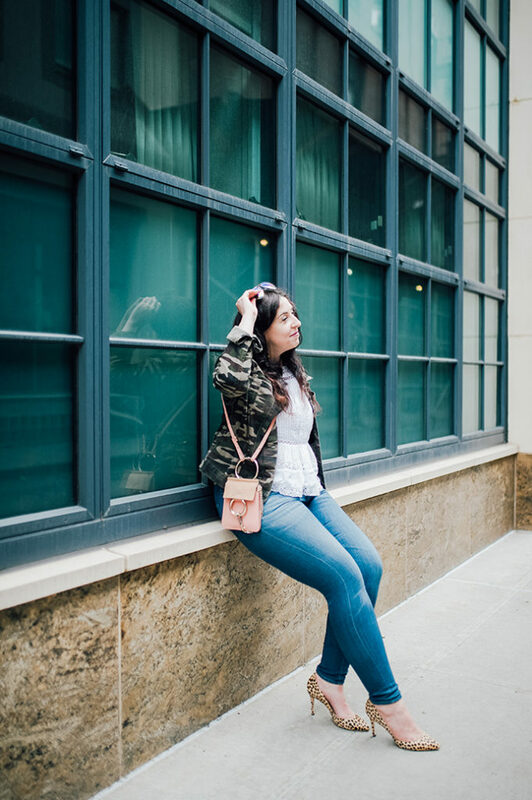 As of this morning, the jacket is 20% off, along with all Anthropologie goodies. 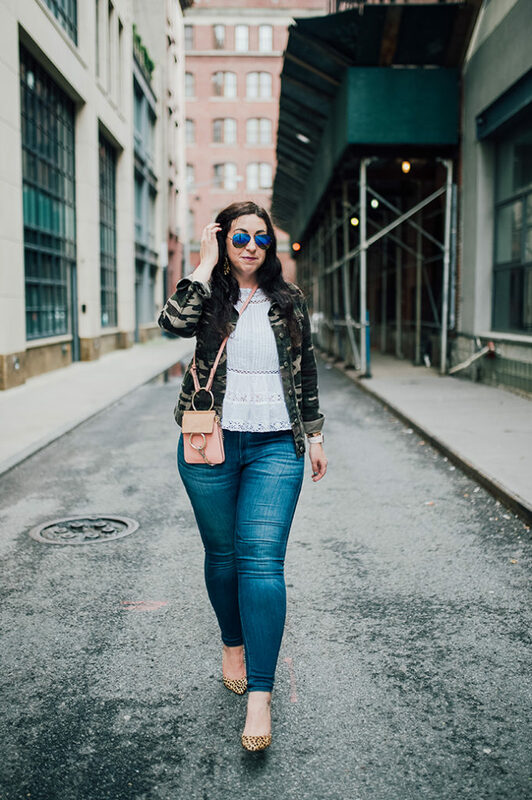 My personal style tends towards softer items, so to tone down the tough qualities of the jacket I’ve paired it with a lace top (an easy way to soften any look! ), big yet incredibly lightweight earrings, a fun stack of bracelets, a pink bag and leopard print pumps. If that doesn’t do the trick I don’t know what will! The jacket is not standing tough by itself though. My aviators, a pre-Costa Rica gift from Solstice, also call back to the military vibe of camo, but in a rainbow lens, it’s much more fun and much less serious! Solstice is having an amazing promotion this weekend — if you like designer sunglasses, I highly recommend checking it out! I’m on the hunt for a good pair of round sunnies myself and I think that with the discount these, these or these would be fabulous. What are your tricks for toning down a masculine piece in your outfits? 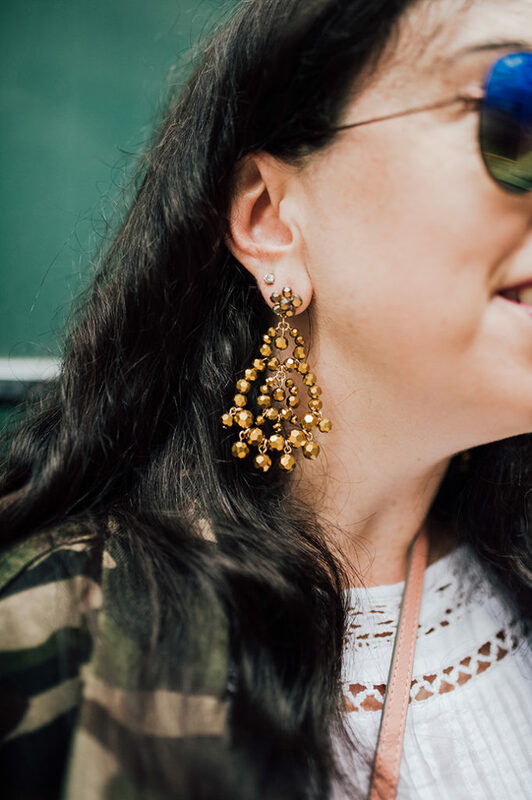 Next Post Celebrate Mom with 20% off your Anthropologie purchase this weekend! I LOVE this camo jacket against your feminine top. Such a pretty combo! Love everything about this outfit-totally stealing this look. Thanks Meena!! I am sure you will love it! Love this entire look, even as someone, like you, who pretty much never wears camo. Well done! Any chance you have a link to some cheaper look alike pumps? Looking absolutely gorgeous in camo!! Such a fun and edgy look! Absolutely love this whole look!!! The shoes rock my world! I think the camo jacket looks great with your light pink purse! Great combo! You look fab?? That print is really cute! I agree it would be more versatile with two shoulders, but I actually don't mind it being one-shoulder. I am in love with your purse and jacket! 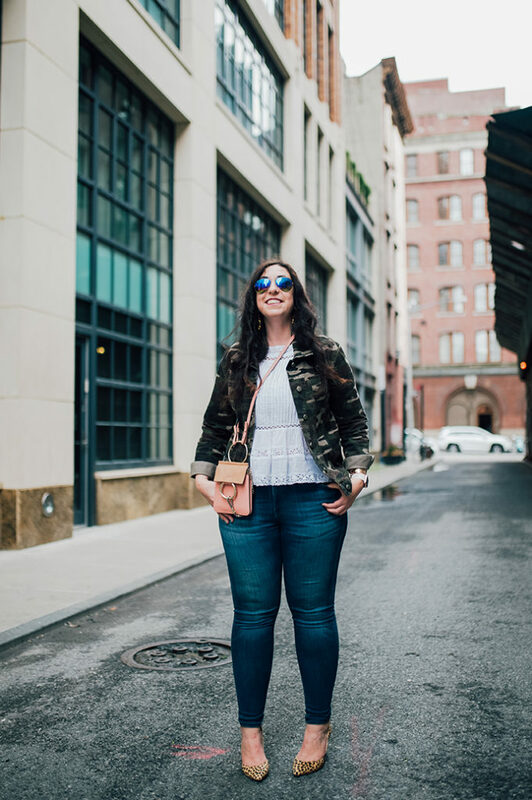 I love a jacket that's functional and easy to wear and throw over everything! Love this adorable little bag and your print mixing! Looks great, and those sunglasses add such a fun touch. I still remember how much I liked the Maeve Camo skirt on you, but I don't think you bought it. Sadly, I tried it, but pencil skirts don't work for me. I did love it!! ?????? But at the time I was working in a very conservative office and that never would have flown. I love camo and how it can so easily act as a neutral. That jacket is so perfect on you! It works surprisingly well as a neutral! Love how you combined that lace top with the camo! I wouldnt have thought of that pairing, but its perfect! Thank you Karen and Swill!! By the way, you are breaking my heart with that amazing Chloe Bag! Ahhhh nothing like retail torture ?? Hee! It's a near-daily wear for me right now. Very cute look! Love the camo jacket! It's very cute with the jeans and even white jeans would look cute too! That's another great idea Kristina! You look lovely and so happy!!! Wow! You made camo look so feminine and chic! I love your whole look! way to print mix!! just fab!! love the mix of print! The camo does go really well with the white top and jeans. I am not a big camo fan either but you look good. You do a great job of feminizing that camo jacket! I love the pumps and the handbag for sure! First, I LOVE that purse!!! ANd love how you've style this jacket. I think pairing a nice feminine pair of shoes with an otherwise masculine outfit creates a nice balance! Nice casual weekend outfit! The animal print shoes are adorable! 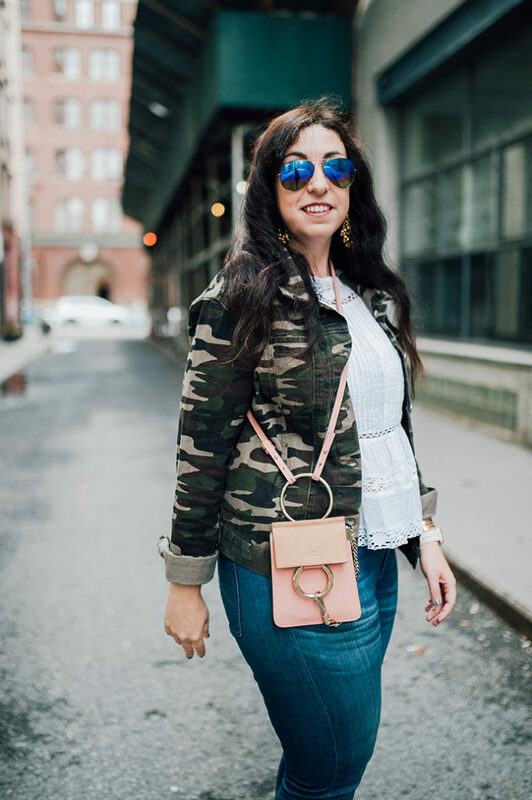 LOVE the camo and leopard and I'm obsessed with your bag! Thanks Stace! 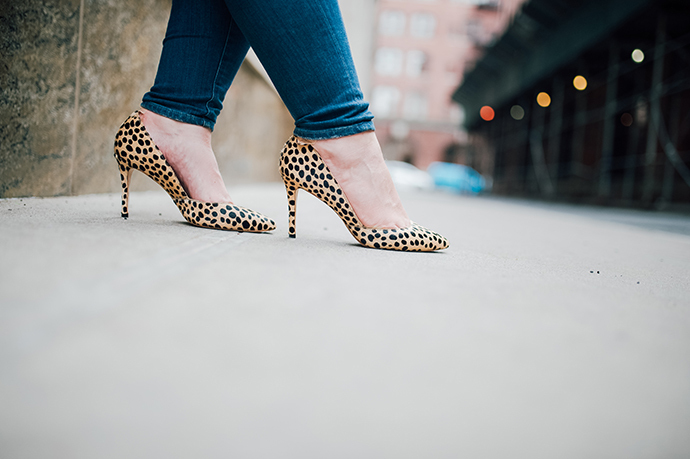 These pumps are a perfect mix of pretty and comfy. What a great camo jacket, and I love how you softened it up with the lace top! I'm obsessing over that cute bag!! Cool outfit! That is something that I can see myself in. That is my type of outfit and I think it looks great on you, too! I love how you combined different patterns, colors and textures to make a unique look. I really need a camo jacket in my life! That purse is adorable by the way! I really do like outfits that can be thrown together in a hurry but look chic. And I love Anthropologie! I can always use a good 20% off sale. I love, Love!, that you not only paired such lovely eyelet with camo, but those pumps? Wow! You're a genius! Camo was in still while I was a teen in high school. I had a pair of feminine cut camo pants that I wore all the time! I loved those things. I really like how it's coming back in style! I definitely love this outfit! It's perfect for a day out with your loved ones or just to have fun. I love your jacket! I don't really wear camouflage that often but it's a lovely print when you're in the mood to wear it. Your outfit is super cute! It has been ages since I've worn anything with camouflage print, but I love how you paired it with the blouse you chose as well as the animal print. 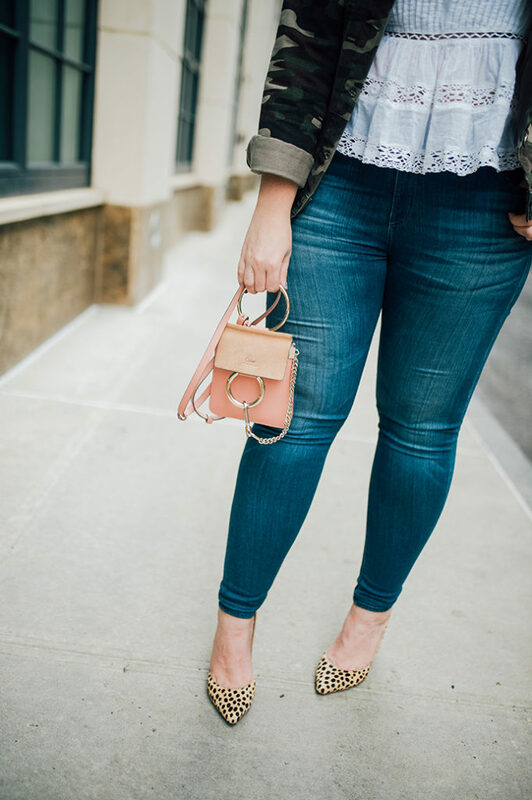 My idea of the perfect outfit is also something I can throw on and go about my day, whether I'm heading to brunch or running errands. Anthro is one of my favorite stores to shop. They have such unique pieces, even though sometimes finding the right size feels impossible. I really love the camo jacket paired with the white lace top. It's so chic. 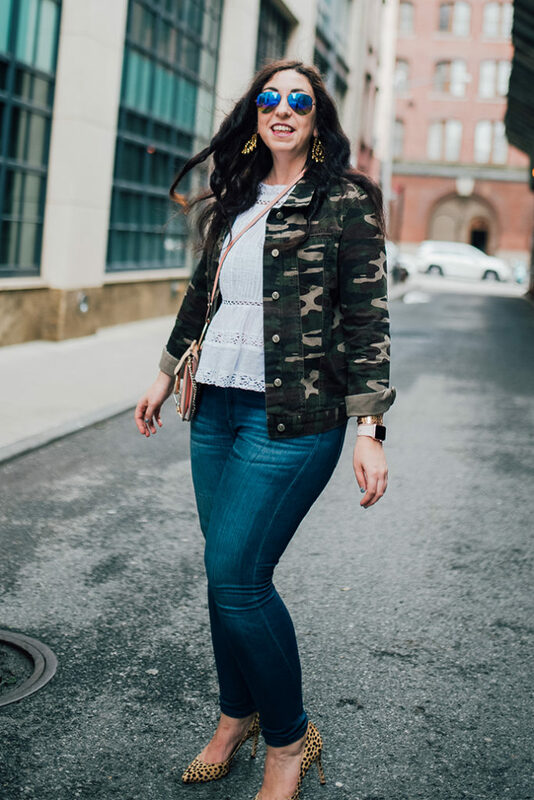 I've never been a camo person either, but I love the way you have styled this!! That purse is so adorable. I love the whole look! The jacket is my favourite. Looks really great on you! I would love to pull this look off! I've always loved the combo of cheetah and camo! Such a good camo jacket! This camo jacket is amazing! Totally need one like this ASAP! What a cute teeny tiny bag! That pink mini bag is my dream! You look great! Rocking the camo! You go girl! Keep it up! I love things that I can just easily throw on. It makes it super easy to get going. I like to have things in my wardrobe that can go with lots of things. This makes completing an outfit very easy.